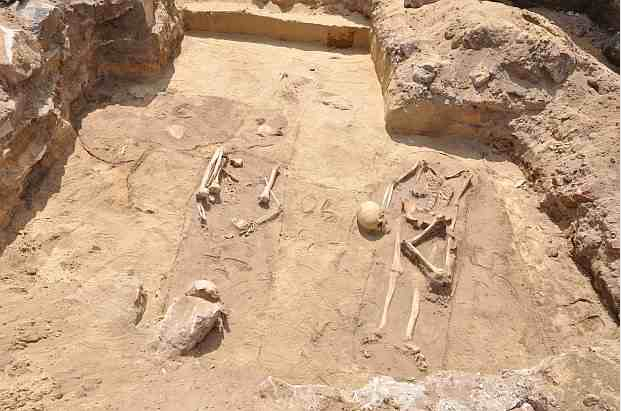 POLOGNE – Gliwice - Archaeologists in Gliwice, southern Poland have discovered a burial ground where the dead were laid to rest in accordance with practices for alleged vampires. Four skeletons were found at the site, where mandatory digs were being carried out prior to the construction of a ring road. In each case, the deceased had been buried with the head between the legs. According to folk beliefs, this prevented a possible vampire from finding his or her way back to the land of the living. There was no trace at the burial ground of any earthly possessions, such as jewellery, belts or buckles. “It's very difficult to tell when these burials were carried out,” archaeologist Dr Jacek Pierzak told the Dziennik Zachodni newspaper. However, it is believed that they took place in the early modern period. Tests are due to me made, so as to determine exact dates. Archaeologists believe that the burials may have been done in such a fashion so as to protect locals from vampire attacks. Another theory is that the skeletons were the victims of cholera epidemic. Further research will be undertaken. The last recorded instance of a vampire burial within current Polish borders was in the village of Stare Mierzwice, Masovia, in 1914. A corpse was dug up in the village, and the head was cut off and placed between the person's legs. 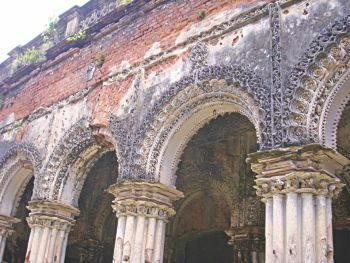 BANGLADESH – Mymensingh - The Atani Zamindar Palace, an emblem of the Muktagachha dynasty in Mymensingh, is almost on the verge of ruin due to lack of proper maintenance. In the absence of proper maintenance, the palace is loosing its grandeur and land areas surrounding it have overgrown with weeds. House fittings, including doors and windows, are currently in a shabby condition. Established in 1727 by Sree Krishna Acharya Chowdhury, the palace was once a centre of power and culture. Many prominent personalities from across the subcontinent, including classical guru Ustad Alauddin Khan, visited the palace several times. USA – x Oxford - City leaders in Oxford, Ala. have approved the destruction of a 1,500-year-old Native American ceremonial mound. A University of Alabama archaeology report commissioned by the city found that the site was historically significant as the largest of several ancient stone and earthen mounds throughout the Choccolocco Valley. 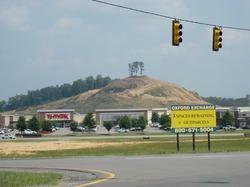 "The City of Oxford and its archaeological advisers have completed a review and evaluation of a stone mound that was identified near Boiling Springs, Calhoun County, Alabama, and have concluded that the mound is the result of natural phenomena and does not meet the eligibility criteria for the Natural [sic] Register of Historic Places," according to a news release Smith issued last week. In fact, the report does not conclude the mound is a result of "natural phenomena" but says very clearly it is of "cultural origin." And while the University's Office of Archaeological Research does not believe the site qualifies for the National Register of Historic Places, the Alabama Historical Commission disagrees, noting that the structure meets at least three criteria for inclusion: its "association with a broad pattern of history," architecture "embodying distinctive characteristics," and for the information it might yield to scholars. The site is also significant to Native Americans. The Woodland and Mississippian cultures that inhabited the Southeast and Midwest before Europeans arrived constructed and used these mounds for various rituals, which may have included funerals. There are concerns that human remains may be present at the site, though none have been found yet. USA – Swanton - Six miles of busy Route 78 west of Swanton will soon be widened. But before that happens, the real big dig has to occur. How the preconstruction project will help preserve the past. "The project is being done in advance of a highway improvement here on Route 78 to improve safety on this heavily traveled road," said Corbett Torrence, the public education coordinator at the Northeast Archaeology Center. "This is known as a data recovery excavation. We recover a certain proportion of the deposits near the road to get as much information as possible before they widen the road because they could damage archaeological deposits. And what we know about this site-- it's one of the most interesting in Vermont, one of the most incredible we've found most recently, simply because firstly, it preserves evidence of occupation over 7,000 years. It's so well preserved because the stratigraphy is very nice, so each layer gives us something to look at and separates all of our occupations through time," explained Gemma-Jayne Hudgell, the project director for Northeast Archaeology Center. 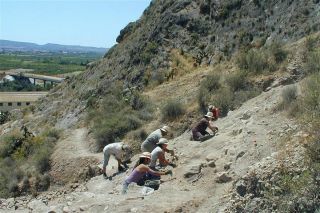 ESPAGNE – Laderas del Castill - The Alicante Archaeology Museum (MARQ) is currently engaged in excavation work at the Laderas del Castill site in Callosa de Segura. This programme, which will continue until the end of the month, is hoped to reveal part of the ruins which are thought to be conserved beneath the residue that covers the pine-forested mountainside where the former village La Bastida de Totana was, the world capital of its time. Amongst the tasks being carried out, the team are opening a new area for excavation and working to clear rubble so as to uncover the walled structures or terraced houses that are thought to exist. If La Bastida de Totana was the world capital 4,000 years ago, the town of Callosa de Segura was the Barcelona of the time. The Bronze Age left its mark on the town but you have to dig to find the last of what was then the largest city of Vega Baja. The museum has put its focus on the site of Callosa, of which records show that it has not been excavated since 1925. At the time the landscape provided everything needed by Bronze man: underground water sources, arable land along the Segura and a rock formation that represented a natural defensive fortification to overlook all outposts approaching from the coast. The dimensions and importance of this settlement must have made it one of the most significant centres of population in the Segura River Basin at the time. The archaeology museums of Alicante and Cataluña currently keep numerous bronze items, ceramic containers, bone utensils and adornments, ivory and mother of pearl, as well as different mills, hammers and other stone tools from the excavations carried out in the area at the beginning of the 20th century. BULGARIE – Brystovitsa - A team of Bulgarian archaeologists have discovered a burial place of a rich Thracian warrior during the excavations near the village of Brystovitsa. The team working on the site explained that they probably came across the richest burial dating back fron the roman times. The director of the Plovdiv Museum of Archaeology Kostadin Kisyov and his team are working on the site. What they found is a unique family grave of a warrior of the 2-3 century A.D. The grave has a diameter of 70 m and is 13 m high. It was full of rare archaeological finds dating back from the Roman period in the Bulgarian lands. The warrior’s body was burnt and placed in a pythos. Around the place the archaeologists found scattered swards and spears, glass vessels, earthenware, bronze sets of vessels featuring mythological themes. The most interesting finds are a gold ring and a coin. USA – Weybridge - In a place like Vermont, history is all around us — even hidden in the ground. Archaeologists are currently digging into the pre-Columbian history at a site along the banks of the Otter Creek behind the Huntington Falls hydroelectric facility in Weybridge. “It’s a Native American encampment, probably dating back to the Middle Woodland period, about 1,600 years ago,” explained David Beale, a staff archaeologist of the Northeast Archaeology Research Center (NEARC) in Farmington, Maine. CHINE – Sheqi - Archaeologists recently completed a four-month project to excavate secret tunnels built nearly 800 years ago in central China's Henan Province. Seven narrow passages beneath the ruins of an ancient town in Sheqi County were discovered in March, and archaeologists believe they served as escape routes for unarmed residents to use in times of unrest, Zhao Hong, a researcher with the Cultural Relics Institute of Henan told Xinhua on Tuesday. Zhao, also the head archaeologist of the excavation team, said that based on the pots found at the entrances to the tunnels and the way in which the underground channels were connected, archaeologists have deduced that people at that time relied on those channels to hide from battles raging above ground. Moreover, based on some other unearthed articles, including pottery, porcelain, stone, iron, bronze and bone wares, archaeologists calculated that the tunnels were built 800 years ago (in the late Jin Dynasty and the early Yuan Dynasty), when wars between different ethnicities left China in states of chaos. "The deepest one is 6 meters below ground. People had to descend from their homes to go down through a shaft chiseled with footholds. Thus, neither the shafts nor the temporary shelters were comfortable, as refugees had to bend low or even creep to pass some sections," Zhao said. "They could survive on food and water stored in the pots or flee via passages leading to exits far from the residences above ground," he added. "From more than 300 bags of porcelain pieces from the tunnels, about 100 objects can be restored, which will be significant for research into the local history, economy and culture," Zhao said.